Heavy rainfall and thunderstorms have been affecting Saint Lucia from April 28th and continuing throughout the day, April 29th and is expected to continue until tomorrow Saturday 30th, when the Met Office expects conditions to improve. Residents of Saint Luca were asked by the Met office to take all necessary precautions against flooding and landslides in areas prone to those hazards. Small craft operators, especially local fishermen were advised against venturing far from port today and tonight because of reduced visibility. Motorists were also advised to exercise extreme caution. This is an Initial Situational Overview [ISO] which usually occurs between 4-8 hours after the all clear has been given, however due to the nature of this event, this ISO was initiated at approximately 2:30pm on April 29, 2011. The assessment at this stage is informed primarily by District Committee surveys. The information from the First Stage allows the DANA Committee to determine immediate actions necessary to respond to the effects of the events, if required. Due to the devastation caused by the passage of Hurricane Tomas on October 30, 2010 several communities and infrastructure were very vulnerable to flooding and land slippage. Preliminary reports also indicate that the Ti Rocher Bride is flooded. The town of Soufriere is flooded. The Ministry of Health has activated their Emergency Preparedness Protocols and is in the process of evacuating the Soufriere Hospital. There is significant flooding reported in the Wingsville area of Soufriere. An emergency shelter has been open to house persons who are in need of shelter. In the Wingsville area there are reports of an electrical pole being on fire. LUCELEC has been noticed and remedial action is been effected. The city of Castries was also flooded, leading to disruption of traffic, businesses and services. The village of Canaries is also significantly flooded. The streets of High Street and Cork streets particularly flooded. 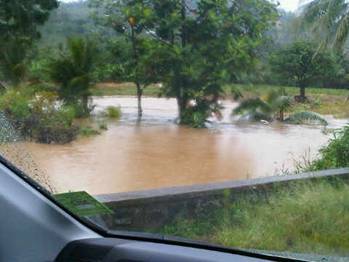 Due to heavy siltation in adjacent rivers, Bexon and other locations were particularly vulnerable with the occurrence of any moderate rain. Preliminary report indicate that the area was severely flooded which might necessitate the evacuation of several households. With the expectation of further rains, it is strongly recommended the communities at high flooding and landslide risk be monitored and evacuated to nearby shelters. It is also recommended that urgent action be taken to desilt clogged ravines and drains. To provide a “snap shot” of the situation. To provide information on overall damages and causalities and needs to permit allocation of critical supplies in the first 24 hours after a disaster. To summarize data on overall damages and causalities by Sector. Summary of Information provided over time in the ISO, IDA and the DSR. It also provides more details on damages in order to continue the allocation of emergency resources. Revision and update on the Second DANA Report. This process can be repeated as needed. From 21 days after the disaster has occurred.